Thoreau's philosophy embodies transcendentalism because his writing expresses the ideas of the over-soul, importance of nature, simplicity, and nonconformity. Thoreau also wrote about living life to the fullest, and how things like society and money can prevent you from doing so. One of his ideas was that your life must be rooted in truth in order for you to be able to truly live your life. Thoreau also felt that to get the most out of life you can't live comfortably. He thought that habit and luxury kept you from enriching your life. 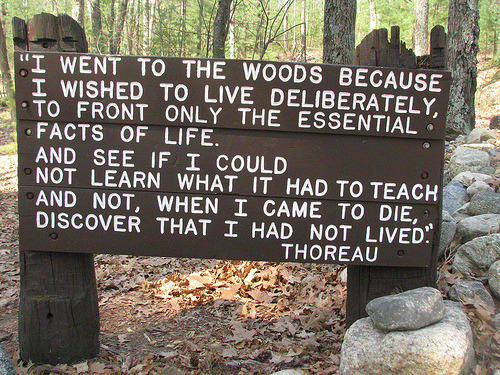 Thoreau also believed in finding yourself and enhancing your life through new experiences. Over all his philosophy was that if you live a simple life where you are in touch with nature, and you are a nonconformist, you will be closer to God and live a better life. Click here to listen to the conclusion of Walden! "Cultivate poverty like a garden herb, like sage. Do not trouble yourself much to get new things, whether clothes or friends. Turn the old; return to them. Things do not change; we change. Sell your clothes and keep your thoughts. God will see that you do not want society. If I were confined to a corner of a garret all my days, like a spider, the world would be just as large to me while I had my thoughts about me. The philosopher said: "From an army of three divisions one can take away its general, and put it in disorder; from the man the most abject and vulgar one cannot take away his thought." Do not seek s o anxiously to be developed, to subject yourself to many influences to be played on; it is all dissipation. Humility like darkness reveals the heavenly lights. The shadows of poverty and meanness gather around us, "and lo! creation widens to our view." We are often reminded that if there were bestowed on us the wealth of Croesus, our aims must still be the same, and our means essentially the same. If you are restricted in your range by poverty, if you cannot buy books and newspapers, for instance, you are but confined to the most significant and vital experiences; you are compelled to deal with the material which yields the most sugar and the most starch. It is life near the bone where it is sweetest. You are defended from being a trifler. No man loses ever on a lower level by magnanimity on a higher. Superfluous wealth can buy superfluities only. Money is not required to buy one necessary of the soul"(Thoreau). In the passage above Thoreau discusses how money and material things are not necessary to get the most out of your life. He says "Sell your clothes and keep your thoughts" (Thoreau), which means the only thing you need are your own thoughts and beliefs. Thoreau believed that by relinquishing yourself of your possessions you will allow yourself to truly live. He felt that money and wealth tied you down and held you back from living life because we become so concerned with what we have and what we want. Another idea he expresses is simplicity. In the passage he says, "If you cannot buy books and newspapers, for instance, you are but confined to the most significant and vital experiences" (Thoreau). By living a simple life without material things, he believed that you would live a life that is rich with new experiences instead of money. Thoreau says that "It is life near the bone where it is sweetest" (Thoreau), which means life has more meaning when you get to the heart of it. He felt that even though a life of simplicity may not be the most comfortable lifestyle, your life will have more meaning because you won't be trapped by money. Living this life would also prevent you from being just another insignificant part of society that is distracted by wealth. I think what many people can take away from this passage is that, we should all look for ways to enrich our lives and live life "Where it is sweetest" (Thoreau). It may not be realistic to get rid of all your things and live in poverty like Thoruea says, but people now a days should look for things that they can do with their lives that don't involve money or materialistic items. By doing this they can apply a transcendental idea to their life and grow from the experiences they have.